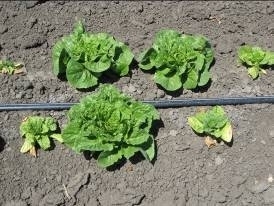 During the month of April 2011 in coastal California, a number of growers and PCAs are seeing wilting and stunting of young lettuce plants. Affected lettuce typically range in size from the 4-to-6 true leaf through rosette stages and are randomly distributed throughout the field as individually affected plants. Such plants initially fall behind in development and may appear slightly stunted. As the problem worsens, these plants will start to wilt during the day. Eventually the older leaves may turn yellow then brown, all foliage wilts, and the plant can collapse and die. Such a condition is caused by two different factors: ammonium toxicity and abrasion of the crown due to wind damage. Ammonium toxicity: This problem results from the buildup of ammonium in soils planted with young lettuce seedlings. Ammonium toxicity occurs when soils are cool and the soil surface is sealed or compacted, resulting in slow nitrification rates. This disorder can also occur in fields with poorly drained, waterlogged soils. The use of fertilizers that contain ammonium can contribute to ammonium toxicity. When the lettuce root is injured by the ammonium buildup, the lettuce foliage will show the stunting and wilting symptoms described above. To make a preliminary diagnosis of ammonium toxicity, examine the entire root system of the young lettuce. The central core of the taproot first turns yellow to light brown, then becomes dark brown to red in color (Photo 1). In severe cases, the central core collapses and a cavity forms throughout the length of the root (Photo 2). 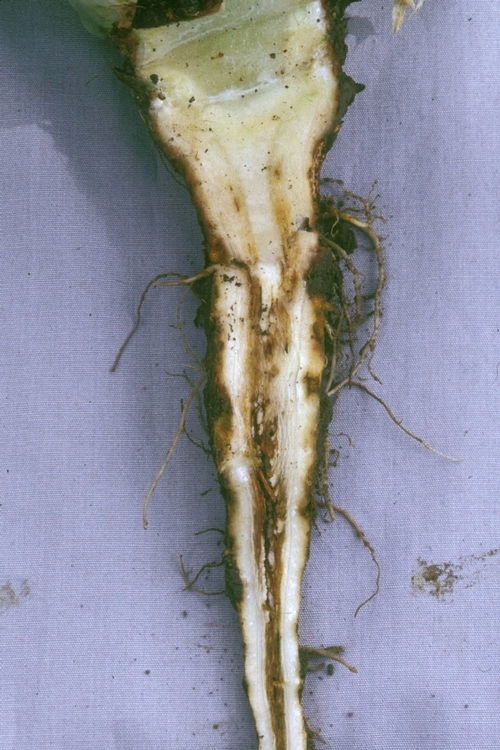 Lateral roots may be short, with blackened tips. In some situations the external surface of the root turns yellow or light brown and develops cracks; these symptoms mimic corky root disease. A more thorough analysis will require testing to eliminate the presence of the fungal pathogen Fusarium oxysporum f. sp. lactucae, the causal agent of Fusarium wilt. Because ammonium toxicity is associated with certain environmental and weather conditions, there are no effective management steps that can prevent this disorder. Crown abrasion or wind-whipping: This problem is the result of physical damage to young lettuce plants. Strong winds will whip the lettuce crown and leaves back and forth, causing the crown to rub against the soil and become injured. 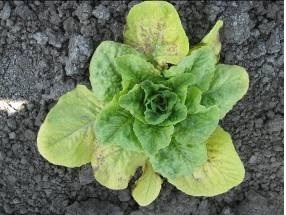 These crowns will show characteristic pinching, drying, and collapse of tissue at the soil line of the lettuce (Photo 3), resulting in the stunting and wilting symptoms described above. In severe cases the lettuce plant can be completely girdled, resulting in the stubbing-off of the base of the plant; such plants will not develop to maturity (Photo 4). This “wind-whipping” of lettuce tends to be more severe in fields having coarser, sandier soils. Because wind-whipping is associated with certain environmental and weather conditions, there are no effective management steps that can prevent this disorder. Not a disease: Neither ammonium toxicity nor wind-whipping is associated with any disease. While above-ground symptoms of both of these disorders may resemble damping-off diseases, lettuce in coastal California is not affected by damping-off pathogens such as Pythium or Rhizoctonia. Corky root disease usually does not result in the distinctive central core discoloration. 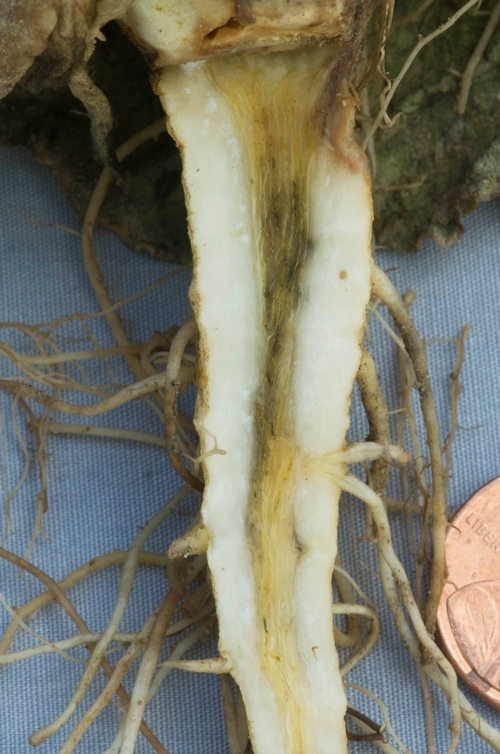 Verticillium wilt may cause central core discoloration, but this disease only shows up on mature lettuce close to harvest and not on such young plants. 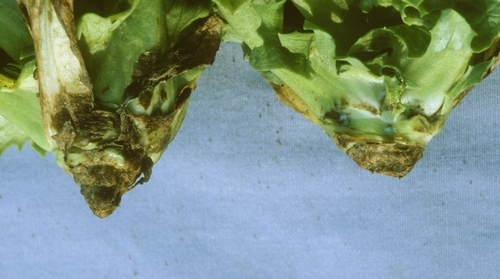 The only disease that looks similar to ammonium toxicity is Fusarium wilt, which can infect young lettuce plants. 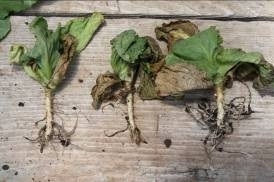 However, Fusarium wilt always occurs in patches in a field and will not occur as individual plants that are randomly scattered throughout the planting. Photo 1: Discoloration of the central core of the lettuce root is characteristic of ammonium toxicity. 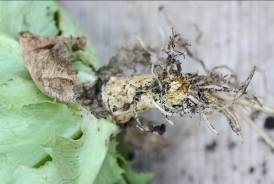 Photo 2: Ammonium toxicity can cause the lettuce root to develop a central hollow cavity. Photo 3: Wind-whipping results in a pinched, collapsed crown at the soil line of the lettuce plant. Photo 4: Severe wind-whipping can completely girdle the lettuce crown.